Eads Mayor Larry Michael received the Tree City USA flag from Colorado State Forest Service for the town's 9th year of participation. The Eads Chamber of Commerce announced sponsoring a contest to commemorate state championships that have been won by Eads High School sports teams. USDA Updates-Rod Johnson: The excessive wind caused some continued erosion problems in some areas. Eads Elementary has been identified as Title I "Distinguished School," one of only two in the state. The school will receive a $10,000 award. Ross Anderson delivers the mail at the age of 89 in Arlington. For more than 66 years he has delivered the U.S. Mail to the residents of Arlington, Colorado. Eads High School teams won first & third places in the annual Scholastic Bowl at La Junta. Fully 100% of the eligible voters cast ballots in Sheridan Lake, the town whose mayor said there would be no election because people weren't interested. 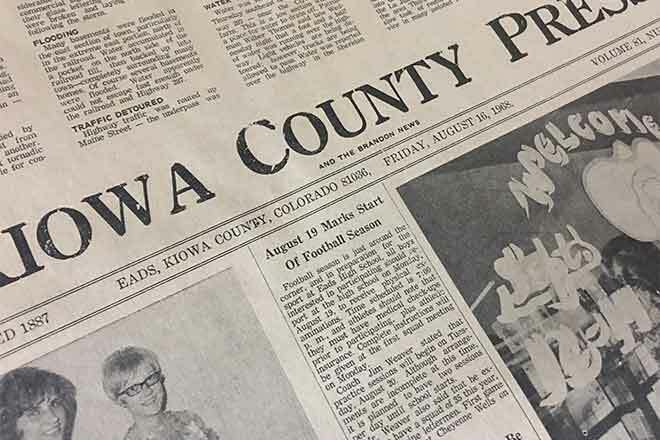 A life-or-death drama was acted out 4 miles east of Eads while a gunman menaced Kiowa County Undersheriff Bob Howerton & 3 ambulance attendants from Weisbrod Memorial Hospital. Randy Thomas received a congratulatory note from the President & Mrs. Jimmy Carter, taking note of young Thomas' upcoming graduation. It was in response to a graduation announcement Thomas sent the President. It was a joint effort of Thomas, Bill Dawson & Scott Bowen, but Thomas return address appeared on the envelope and the President's note was address to Randy. The Missouri Pacific will purchase additional 1,000 new rail cars, expanding its improvement program in 1978. Kiowa County has marked a 5.9% growth since 1970, according to recent estimates of the Bureau of the Census. A small turn-out for the Eads Town Election. A total of 47 ballots were cast at the regular Town Election. People in the oil industry may want to take a closer look at Kiowa County, as announcement of an oil strike on a wildcat location north of Eads. Milford Mills, Inc. announced their packaging plant at Towner will conduct an open house. People in Kiowa County have spent much of the past week fighting prairie fires that raced through the county in many places. Missouri Pacific trains set some of them, while others were caused by pure careless on the part of folks burning weeds. Mr. & Mrs. W.E. Herron of Eads received official information which states their son, Corporal Carl R. Herron, United States Marine Corps, is a prisoner of war. At meeting of the Board of Kiowa County Commissioners, a contract was let to Mr. Laird of Greeley County, Kansas, for the grading of nearly 100 miles of state roads in Kiowa County.